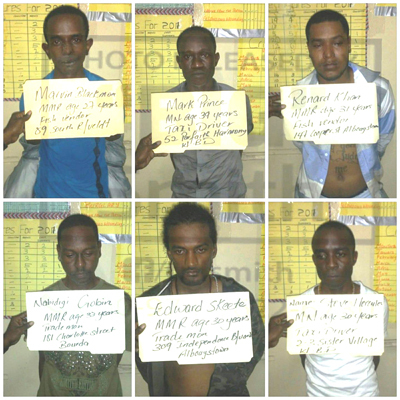 The six men who were recently nabbed in a stolen car at a roadblock at Grove Public Road, East Bank Demerara are expected to be arraigned in court today to answer to several charges. Of the men arrested, two are former murder accused, and three other individuals are out on bail for previous armed robbery charges, they are all expected to be arraigned in court today. One of the suspects has been described as a ‘serial robbery accused’ who was in court on similar charges just a day prior to his arrest. Police have identified the suspects as Steve Hercules, 30, of Lot 2-3 Sisters Village West Bank Demerara; Nabadinghi Gobin, 33, of Lot 181 Charlotte Street, Bourda; Renard Khan, 31, of Lot 147 Cooper Street, Albouystown; Mark Prince, 39, of Lot 52 Parfait Harmonie, West Bank Demerara; Edward Skeete, 30, of Lot 309 Independence Boulevard and Marvin Blackman, 27, of South Ruimveldt. The police had applied for an extension on Thursday to further interrogate the suspects before placing them before the court. According to report, the six men had attempted to commit an armed robbery on poultry farmer Michael Chang Yuen, 69, a Chinese national at Supply, East Bank Demerara. It was reported that Chang was with his two sons when he heard a noise outside. On checking, he saw four men in his yard. He raised an alarm and the suspects fled in a car, HC 4543. Police intercepted the suspects at a roadblock on the Grove Public Road, East Bank Demerara. They were in possession of two 9MM Glock pistols, with 22 live rounds; a Beretta Pistol with 11 rounds; a. 32 Taurus Pistol with six live rounds; along with a sledgehammer, two pairs of latex gloves, and trade plates. Kaieteur News understands that the firearms were handed over Friday to the Force’s ballistics experts. The experts will seek to ascertain whether the firearms are linked to any other crimes. The serial numbers from at least one of the handguns has been filed off. Police said that the vehicle the suspects were in was stolen from its owner during an armed robbery on March 25, last, at Princess Street.